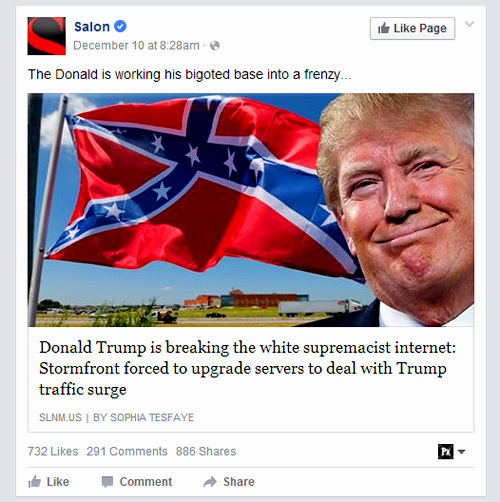 Hosting and promoting racist violence for years, the white supremacist oldest site on the Internet got shot down last night. The invisible war against hate continues. Expect the KKKChumph and Jefferson Davis Sessions to jump on their swaback white nags at any minute to ride to the rescue. Stormfront, the oldest neo-Nazi and white nationalist website on the English-speaking internet, has now become the second far right website to be blocked by its web domain registrar, Network Solutions, from being accessed by the public. The action appears to have been taken at the instigation of the left-leaning Lawyers Committee for Civil Rights under its Stop Hate Project which lodged a complaint about Stormfront to Network Solutions on Aug. 22. In operation since 1990 as a bulletin board and 1995 as a web forum, Stormfront claimed to have over 300,000 registered members. The site’s owner, former Ku Klux Klan leader Don Black, is officially opposed to violence, but several of his members have been linked to various murders. Stormfront has become the second major neo-Nazi website to find itself blocked from its web domain in recent weeks after a-fascist allegedly struck and killed a counter-protester at a white nationalist rally in Charlottesville, Virginia. The Daily Stormer, the most popular neo-Nazi website, has found itself banned by multiple registrars including GoDaddy, Google, Namecheap as well as by the network security service Cloudflare. We are under a full-on assault. And there is an intelligence operation being run on us. We need to be aware of this, we need to act with knowledge of it, and we need to understand that the number one thing that they want to do is turn us against one another. Sites are now going to start dropping like flies. And this is because there wasn’t a significant enough rally around Daily Stormer. I think people within the movement did rally around us, but others within the larger right-wing did not. . . . I think some people are maybe in denial about what is happening right now. This is a huge move to simply silence us, completely. Hopefully, we can get enough attention that we can force the government to intervene, and begin regulating ICANN like they did before Obama gave it away in October of last year. The practice of blocking white nationalist domain names has come under attack from some free speech advocates as well. Making bigotry (and stupidity) expensive…North Carolina just lost 400 jobs. Now – if companies are willing to do this for LBGT people…Why not in states where minorities are persecuted? I mean…There are places I wouldn’t consider working because of economic or quality of life considerations. Quality of life also means the level of racism in a city. That impacts businesses ability to recruit and retain qualified and senior staff. Two weeks after unveiling plans to open a global operations center in Charlotte, North Carolina, that would employ more than 400 people, PayPal says it will instead look elsewhere due to a new state law that blocks anti-discrimination rules for gay and transgender people. The law, approved by the state’s Republican-controlled legislature and Gov. Pat McCrory, came in response to a Charlotte City Council ordinance approved in February that would have extended protections to gays and lesbians, as well as bisexual and transgender people, at hotels, restaurants and stores. Charlotte also would have allowed transgender people to use restrooms aligned with their gender identity. The law blocked Charlotte’s rules and prevented other local governments from approving similar ordinances. The online payments company is joining a growing list of companies that oppose the law, with Apple (AAPL), Google (GOOGL), American Airlines (AAL) and Bank of America (BAC), as well as the state’s professional basketball team, among those calling for a repeal. Atlanta’s mayor has reportedly banned taxpayer-funded travel to North Carolina over the law, following similar actions by officials in states including New York, Connecticut, Minnesota and Washington. Spurred on by racist rhetoric, and calls for vicious attacks on lone protesters at Trump campaign rallies – the folks in Chicago decided to push back in what may well be the first of a series of major counter protests. This ain’t America of the 1920’s. or 1950’s anymore where going after Minorities was a safe bet because they as a group were less than 20% of the population. 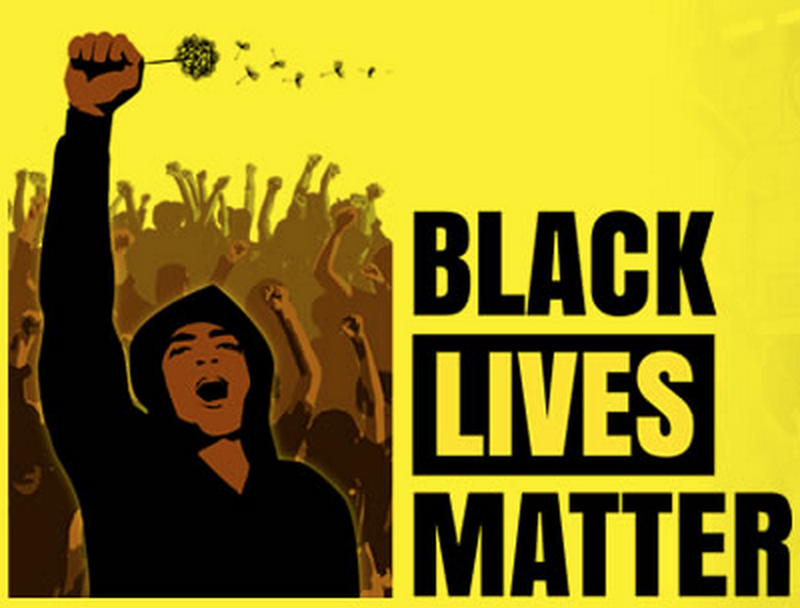 Blacks, Hispanics, Asians, Muslims, and other minority groups now make up 40% of the population. And I have tried to explain to some of my recalcitrant friends and associates – there is no shortage of “brass cajones” on the side of folks who oppose Trump’s racism. Chaos broke out after the event was called off. A Donald Trump rally that attracted thousands to the University of Illinois at Chicago was abruptly canceled Friday night amid his campaign’s security fears, sparking shouting and scuffling between the candidate’s fans and anti-Trump protesters. Chicago police said two officers were hurt, including one who was struck on the head with a bottle. At least two other people were taken to a hospital with minor injuries, according to news reports. Five people were arrested. The rally was called off about a half-hour after the scheduled 6 p.m. start time, after thousands of Trump fans and anti-Trump protesters packed into the free event, which required online registration. Thousands more gathered outside, surrounded by a police perimeter, and people became more vocal as the starting time approached. Chaos broke out when the cancelation was announced, according to media reports from inside the pavilion. CBS News said reporter Sopan Deb, who covers the Trump campaign, was detained by authorities. “I have never seen anything like it. It’s amazing,” CNN’s Jim Acosta said. The network said approximately 8,500 people were at the rally. Violence has become a recurring theme at Trump events, with protesters beingbeaten, shoved, kicked and verbally abused. Trump has encouraged supporters to attack protesters, saying they should “hit back” more often, and has offered to pay legal fees if they do. Clashes between protesters and Trump supporters at a St. Louis rally earlier on Friday led to at least one injury and 32 arrests. On Wednesday, a Trump supporter at a North Carolina rally sucker-punched a protester and was charged with assault and battery. In a subsequent appearance on Fox News, Trump told Greta Van Susteren it was “a good decision” to cancel the rally. “I am a unifier,” he said, even though thousands had gathered at the event to protest him. 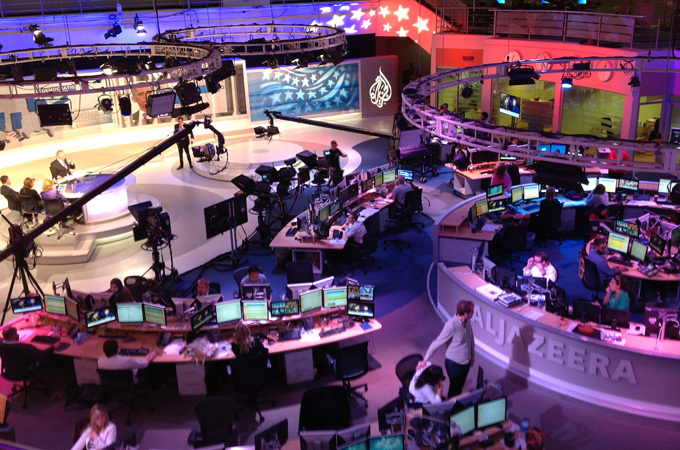 Al Jazeera America is shutting down its operations in the United States by the end of April, the company told employees in a meeting Wednesday. The cable channel launched in 2013 after Al Jazeera purchased Current TV, the progressive news channel co-founded by Al Gore. “There is no God but Allah, and Muhammad is the messenger of Allah.” In the Middle East you will find this statement at the entry to every Mosque, as well as displayed in the homes and businesses of the faithful. It also is quite possibly the most recognized piece of Calligraphy in the world, even among those not of the Islamic faith. So what happens when American christian bigots confront the world’s most known calligraphy? You betcha. For a religion supposedly founded on the blood of martyrs who were fed to the Lions and tortured but stood firm in their faith…These modern “christians” sure have some weak faith. So weak in fact, it is no faith at all. A Virginia school district closed all of its schools and offices after an outcry over a high school geography lesson that included an example of Arabic religious calligraphy. The school said the lesson wasn’t to promote Islam but to study “the artistic complexity of the calligraphy,” superintendent Eric Bond said in a news release cited by the News Leader newspaper. In addition, the Virginia Department of Education confirmed to the Daily Progress that the lesson met state geography standards, which require learning the language and religion of each region under study. But some parents were outraged. “I will not have my children sit under a woman who indoctrinates them with the Islam religion when I am a Christian, and I’m going to stand behind Christ,” Kimberly Herndon, an Augusta County parent, told CBS 6. Herndon also organized a community meeting at a local church. On Facebook, Herndon said the geography teacher, Cheryl LaPorte, should lose her job. Some students said the lesson made them uncomfortable. A Facebook page set up to protest the school was quickly overwhelmed by posts in support of the teacher. It was eventually taken offline, according to the News Leader. Arneson said the class taught her to understand people of different cultures and faiths. “I feel that’s a part of growing up is learning acceptance,” she said. “I was hoping that we’ve come further along in our community to be more open-minded,” Riverheads alumni Grace Zimmerman told ABC station WHSV. Despite support from students, the district has been receiving numerous complaint calls and emails, many of which were sent from people outside of the area. 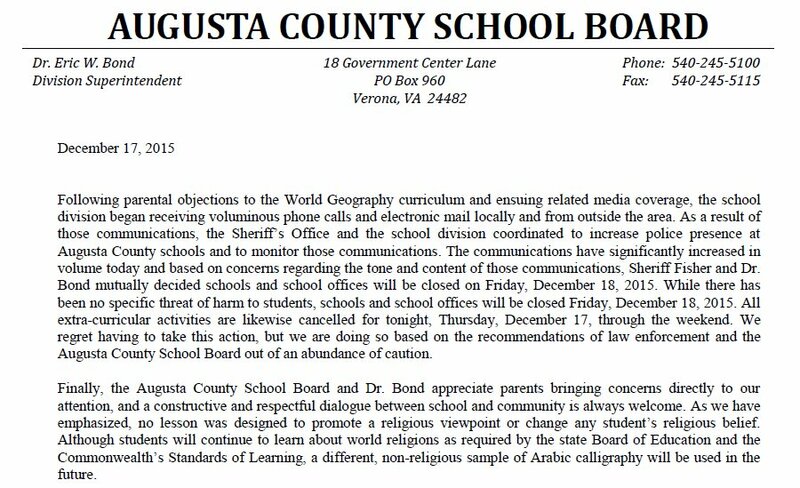 The Augusta County Public Schools said the sheriff’s department recommended the closure of schools due to “concerns regarding the tone and content” of the communications, according to a statement from the school board posted online by NBC 29.